Here’s a classic ‘ukulele chalangalanger. 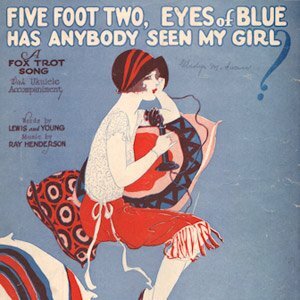 Five Foot Two, Eyes of Blue, also known as Has Anybody Seen My Gal? is a prime example of cycling 7th chords and that old swing/tin-pan alley sound that it creates. So get out your banjo ukes and sing along! The arrangement is pretty simple – you can add to the melody by just strumming a harmonizing chord on the 1 or the 1 and 3. There is a lot you can do to make the chords more interesting, but I always like to provide a framework that you can embellish rather than do the work for you and exclude beginner players. If it’s too easy, make it harder.